Centralization is the enemy of the internet. If you want control over your internet access and the freedom to do as you like online, then you are against centralization. Another word for it would be “monopoly” because, as the internet essentially runs on a capitalist system, monopolies are what will cause censorship, outrageous costs and even outages due to contract disputes between companies. Today, we saw a great example of the perils of monopolizing the net. A DDoS attack (distributed denial of service) that targeted one of the biggest DNS providers in the country ended up downing the websites of Twitter, Netflix, Amazon, Shopify, Spotify and thousands of other smaller businesses for a good 6 – 7 hours. That sounds scary, for sure. However, the fact that all the services affected were using the same DNS service, Dyn, means that internet businesses shouldn’t all be using the same services to run their websites. But the funniest part about Gizmodo’s article is that it completely ignores the fact that top internet engineers, movers and shakers are already working together to decentralize the internet. It’s not a fear that anyone who is actually involved in internet architecture is really worried about since centralization and monopolies have *always* been a threat, even as far back as the 1980s when internet service providers first started popping up. Furthermore, DDoS attacks are as old as the internet itself (just as decentralization is). As soon as people figured out how to send too many garbage packets for a server to handle at once, DoS attacks were born, and it didn’t take long for it to turn into large scale or “distributed”, DoS attacks (DDoS). Just because they are getting more sophisticated doesn’t mean DDoS protection isn’t getting better, too. 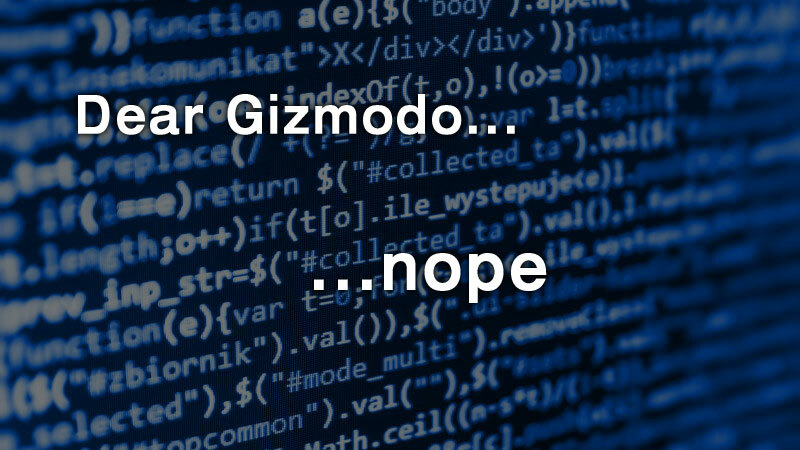 In the Gizmodo article, the author claims that hackers are able to “take down the internet at will”. Since when are only the major players considered to be “the internet”? Last I checked, the internet is so vast, with literally millions of new websites popping up every day, that it’s not even close to accurate to say that anyone can “take down the internet”. If someone wanted to do that, they’d have to do something a lot bigger than a simple DDoS attack at a DNS provider. The idea that one major DDoS attack means we are all doomed is clickbait, plain and simple. I thought Facebook had some sort of new algorithm in place to catch these sorts of sensationalist headlines?